So, you want a position in the medical field and you are looking for study opportunities but you can’t quite tell the difference between a medical assistant and a medical administrative assistant? Don’t worry, it’s pretty common, the job titles sound fairly similar and don’t give any indication of the precise nature of the position. To help you out, we here at Northwest have put together a short guide to the differences between a medical assistant and a medical administrative assistant that should hopefully make your decision on which of these amazing career paths to choose a little easier. Both medical and administrative assistants work to empower professionals, such as doctors, managers, and technicians, to perform their jobs. The assistants provide clerical support, acting as generalists for the disparate jobs needed to keep a healthcare practice running optimally. Both medical assistants and medical administrative assistants normally work full time in climate-controlled and well-lit environments. Shift patterns may include evenings or weekends, as well as normal business opening hours, depending on the operating times of their facilities. Both medical and administrative assistants can be called upon to handle clerical tasks and necessary paperwork at their healthcare practice. They might be asked to answer phones, receive and distribute paper mail, respond to emails, maintain paper and electronic filing systems, complete forms, and operate office machines such as fax machines and printers. Both roles only require a high school diploma or equivalent because they receive training on the job from more experience clerical staff, or from supervisors. However, additional training is available in business schools or community colleges. Voluntary certification from national organizations may enhance employment value because it represents documented proof of expertise. Aside from clerical tasks, medical assistants are often called upon to perform clinical tasks that administrative assistant are not qualified to do. Medical assistants can help with patient examinations, give patient injections, and prepare blood and other specimens for laboratory tests. The restrictions on what a medical assistant can do is normally dependant on what state they are in. Medical assistants can only work under the supervision of a doctor and must be able to keep health information confidential. Additionally, medical assistants learn the specific medical terminology and procedures associated with medicine. However, all assistants are expected to learn technical medical vocabulary. Medical assistants earned less than administrative assistants at a mean $33,580 per year, or $16.15 per hour, as of May 2017, according to the U.S. Bureau of Labor Statistics. Around 57 percent worked in doctors’ offices to average an annual $33,570, or $16.14 per hour. However, their highest pay was in junior colleges at a mean $40,580 yearly, or $19.51 hourly. Administrative assistants averaged $59,400 per year, or $28.56 per hour. Their biggest employers were colleges, universities and professional schools, with 44,780 of the total jobs and mean salaries of $58,530 yearly, or $28.14 hourly. The highest paying employers were nonmetallic mineral mining and quarrying companies, averaging an annual $75,580, or $36.34 per hour. The job outlook for medical assistants was higher than that of administrative assistants, with predicted growth of 29 percent over the next decade while employment for medical administrative assistants is expected to increase by 23%. This increase in employment rates is still massive in comparison to an expected increase of 22 percent for other health care support occupations, 7 percent for all jobs in all fields, and just 1 percent for general office and administrative support jobs. This increased demand for medical assistants and medical administrative assistants is, in part, due to the aging baby boomer population in the US. 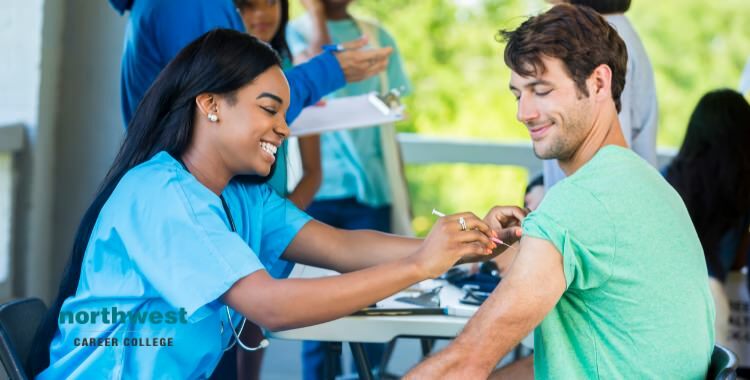 As this population demographic continues to age, it will require more medical services that current medical staff can be expected to handle, making now an excellent time to qualify as either a medical assistant or a medical administrative assistant.